This includes NORTHERN IRELAND (i.e.BT - ALL CODES). Fabric Code. Fabric Width is a minimum of 54"/1.38m. The Fabric Code will be WUN followed by a number. AB 31-33 & AB38 AB 44-56, DD7-11, FK17-99, G83, HS1-9, IV1-56, KA27-28, KW1-17, PA20-48,PA60-78, PH18-26, PH30-44, ZE1-3. Fabric Code. Fabric Width is a minimum of 54"/1.38m. The Fabric Code will be WUN followed by a number. This includes NORTHERN IRELAND (i.e.BT - ALL CODES). Material: ChenilleWidth: 46 - 59"
Fabric Width is a minimum of 54"/1.38m. Fabric Code. The Fabric Code will be WUN followed by a number. AB 31-33 & AB38 AB 44-56, DD7-11, FK17-99, G83, HS1-9, IV1-56, KA27-28, KW1-17, PA20-48,PA60-78, PH18-26, PH30-44, ZE1-3. Fabric Code. Fabric Width is a minimum of 54"/1.38m. The Fabric Code will be WUN followed by a number. AB 31-33 & AB38 AB 44-56, DD7-11, FK17-99, G83, HS1-9, IV1-56, KA27-28, KW1-17, PA20-48,PA60-78, PH18-26, PH30-44, ZE1-3. A heavy, thick and fire retardant treated upholstery fabric. Ideal for upholstery projects, caravan, sofa, chairs etc. This is a clearance fabric from a top sofa manufacturer. SUPERB HIGH QUALITY UPHOLSTERY FABRICS. Fabric Width - 153cm (60") approx. Not fire retardant coated, giving it a softer feel but you would need to check current regulations if using for upholstery. Create wonderful curtains, upholstery, blinds, cushions, headboards etc. etc. DARK GREY - STYLISH CHENILLE UPHOLSTERY FABRIC - with a Soft but CHUNKY Textured Finish - This is a quality fabric that is ideal for a variety of upholstery/furnishing projects. This appears to have been fire retardant back coated. SLATE GREY - STYLISH VELVET CHENILLE UPHOLSTERY FABRIC - with a Super Soft Finish - This is a quality fabric that is ideal for a variety of upholstery/furnishing projects. This appears to have been fire retardant back coated. BEIGE - CHENILLE WEAVE UPHOLSTERY FABRIC - with a Semi-Plain Finish. Soft Chenille Natural from Next it is an. 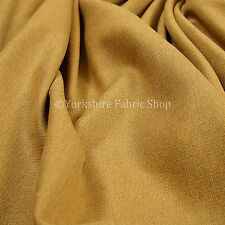 - It is a fabulous quality fabric, which would be ideal for a multitude of upholstery & furnishing projects. Fabric Code. PATTERN REPEAT - n/a cm Vertically. Fabric Width is a minimum of 54"/1.38m. The Fabric Code will be WUN followed by a number. ISLE of MAN - ISLE of WIGHT - CHANNEL ISLANDS. This includes NORTHERN IRELAND (i.e.BT - ALL CODES). Colour: CreamMaterial: ChenilleWidth: 46 - 59"
BLACK- STYLISH VELVET CHENILLE UPHOLSTERY / CURTAIN FABRIC - with a Soft Finish - This is a quality fabric that is ideal for a variety of upholstery/furnishing projects. This does appear to have a Fire Retardant Backing. Pattern Repeat: ~ cm Vertically and ~ cm Horizontally. ISLE of MAN - ISLE of WIGHT - CHANNEL ISLANDS. Fabric Code. Fabric Width is a minimum of 54"/1.38m. The Fabric Code will be WUN followed by a number. Green- STYLISH CHENILLE WEAVE UPHOLSTERY / CURTAIN FABRIC -from M&S- (It has a Fabulous Woven finish) - A quality heavyweight chenille, it is ideal for a multitude of furnishing projects including furniture, curtains and caravans.This appears to have been fire retardant back coated. This does not appear to have been fire retardant back coated. Fabric Width is a minimum of 54"/1.38m. Fabric Code. ISLE of MAN - ISLE of WIGHT - CHANNEL ISLANDS. The Fabric Code will be WUN followed by a number. Hardwearing Durable Soft Linen Effect Effect Chenille Fabric. Available In Many Beautiful Colours. This Style Of Fabric Can Be Used For The Following : Upholstery, Crafts, Curtains, Chairs, Cars, Re Upholster, Covers & Many More Uses. Indigo Denim Blue - STYLISH CHENILLE WEAVE UPHOLSTERY FABRIC - we are not sure from which designer - it has a fabulous plain design - A quality heavyweight chenille, it is ideal for a multitude of furnishing projects including furniture, curtains and caravans.This appears to have been fire retardant back coated. Material: Soft Chenille Fabric - Made From Polyester. Fabric Roll Width: 135cm. Our Picture Does Not Do Justice To This Beautiful Soft Fabric - Order A Fabric Sample Before Ordering. This appears to have a Fire Retardant backing too - which stiffens the fabric a little. This includes NORTHERN IRELAND (i.e.BT - ALL CODES). Fabric Code. Fabric Width is a minimum of 54"/1.38m. The Fabric Code will be WUN followed by a number. This includes NORTHERN IRELAND (i.e.BT - ALL CODES). Fabric Code. Fabric Width is a minimum of 54"/1.38m. The Fabric Code will be WUN followed by a number. Lilac (Pale Purple) - STYLISH CHENILLE UPHOLSTERY FABRIC - possibly from DFS - it has a fabulous plain design - A quality heavyweight chenille, it is ideal for a multitude of furnishing projects including furniture, curtains and caravans.This appears to have been fire retardant back coated. Gold - CHENILLE UPHOLSTERY / CURTAIN FABRIC - with a Plain Chunky Finish - It is the Toronto design from Fryetts and the colour is Gold - It is a fabulous quality fabric, which would be ideal for a multitude of upholstery & furnishing projects. Fabric Composition: 42% Viscose, 14 % Polyester 12% Linen and 12% Cotton. This includes NORTHERN IRELAND (i.e.BT - ALL CODES). Fabric Code. Fabric Width is a minimum of 54"/1.38m. The Fabric Code will be WUN followed by a number. Ending 22 Apr at 9:11PM BST1d 11hColour: BlueMaterial: ChenilleWidth: 46 - 59"
This appears to have been fire retardant back coated. Fabric Code. Fabric Width is a minimum of 54"/1.38m. The Fabric Code will be WUN followed by a number. AB 31-33 & AB38 AB 44-56, DD7-11, FK17-99, G83, HS1-9, IV1-56, KA27-28, KW1-17, PA20-48,PA60-78, PH18-26, PH30-44, ZE1-3. MINK & CHARCOAL - CHUNKY CHENILLE WEAVE UPHOLSTERY FABRIC - It has a Fabulous Chunky Woven finish - A quality heavyweight chenille, it is ideal for a multitude of furnishing projects including furniture, curtains and caravans. GREY - CHENILLE WEAVE UPHOLSTERY FABRIC - with a Chunky Finish - This is a quality fabric that is ideal for a variety of upholstery/furnishing projects. This appears to have been fire retardant back coated. NEXT Soft Feel Black Chenille Curtain Upholstery Fabric Material 153cm SALE! Fabric Width - 153cm (60") approx. A super quality soft feel NEXT chenille fabric in a black. Not fire retardant coated, giving it a softer feel but you would need to check current regulations if using for upholstery. Fabric Width is a minimum of 54"/1.38m. FABRIC CODE: WUN7845. The Fabric Code will be WUN followed by a number. AB 31-33 & AB38 AB 44-56, DD7-11, FK17-99, G83, HS1-9, IV1-56, KA27-28, KW1-17, PA20-48,PA60-78, PH18-26, PH30-44, ZE1-3. Colour: BeigeMaterial: ChenilleWidth: 46 - 59"
This appears to have a Fire Retardant backing. Fabric Minimum of 54"/1.38m - PATTERN REPEAT: Vertically ~ cm and ~ cm Horizontally. Fabric Code. The Fabric Code will be WUN followed by a number. ISLE of MAN - ISLE of WIGHT - CHANNEL ISLANDS. Luxury Mink Chenille Heavy Curtains ?Upholstery ? Caravan?Fabric Roll 10 Metres. 5.4 mtrs Ross Fabrics Carnaby Plush chenille upholstery fabric. Colour - 'Aqua'.